Heaven forbid a distinguished Harvard professor write about something so common as a comic book character! Lepore, I hasten to say, is one of my favorite historians. She has a wonderful knack for storytelling, bolstered by a commitment to intensive archival research. Somewhere in the depths of my Twitter archive is a tweet reading, “I want to be Jill Lepore when I grow up.” I am unquestionably geeky when it comes to my admiration for her. But Lepore’s speciality has always been early America—she’s written books about slavery in New York, King Philip’s War, and Ben Franklin’s sister. How in the world did she wander into the twentieth century and write a book about Wonder Woman? The answer, she revealed in a lively and hilarious talk (Lepore turned out to have excellent comic timing and mile-a-minute energy, despite suffering from a bad cold), is that she stumbled onto the Wonder Woman story while researching an article on Planned Parenthood for the New Yorker, where she’s a staff writer. William Moulton Marston, the creator of Wonder Woman, had a somewhat unconventional domestic arrangement that involved both his wife, Elizabeth Holloway Marston, and his mistress, Olive Byrne, living together with him and their combined four children (Marston had two with each woman). Byrne’s aunt was Margaret Sanger, the founder of Planned Parenthood, and, Lepore argues, one of the inspirations for Wonder Woman. Lepore suggests that Marston found other inspirations for Wonder Woman—who fought for “peace, justice, and equal rights for women”—in the suffragist and feminist movements of the 1910s. Using an impressive array of visual evidence in her presentation, she demonstrated how the images of those political and social movements later appeared in the pages of Wonder Woman comics. Suffragists chained to the railings at 10 Downing Street; Wonder Woman in chains. Margaret Sanger with a gag tied over her mouth as she protested her inability to speak publicly about birth control; Wonder Woman silenced in similar fashion. Marston was strident in his desire to push equal rights for women and infused these messages into his comic works. A Harvard-trained psychologist (he also invented the lie-detector test), Marston explicitly referred to Wonder Woman as “psychological propaganda” meant to promote feminism. That feminist message is the source of Lepore’s interest in Wonder Woman; she admitted that as a writer on comics, she suffers from a “lack of cred,” having never read Wonder Woman as a child nor watched the 1970s TV show when she was growing up. 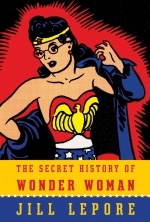 Her goal in this book is to demonstrate that Wonder Woman serves as a link between First Wave feminism in the early twentieth century and Second Wave feminism in the 1970s, when Wonder Woman was taken up by activists as one of the symbols of the movement (the inaugural issue of Ms. Magazine featured Wonder Woman on the cover). I’m not sure I buy Lepore’s argument that we shouldn’t be talking about “waves” of feminism, but rather “a continuous history of women fighting for their rights” (is Wonder Woman [created by a man, albeit a feminist] enough to hang that thesis on? ), but I’m only about 50 pages into her book, so I have plenty of time to be convinced (or not). And whether I ultimately find that particular thesis solid, Lepore has picked up on a fascinating story, one that might seem miles away from her previous work but does share some connections with it. 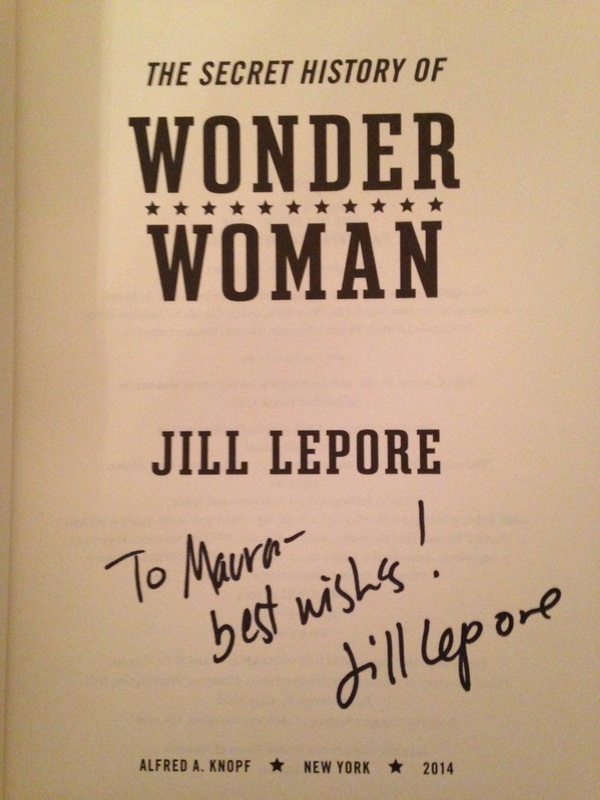 During the Q&A portion of her talk, I asked Lepore to discuss how she got from Ben Franklin’s sister to Wonder Woman. She replied that both projects involved taking a familiar figure and burrowing in to find an unknown angle on their stories. That sense of discovery and delight in the unexpected is, I think, what drives her work, and the joy she takes in storytelling is what makes her books so compelling to me. Whenever people ask me how I got interested in history, my answer is that I’ve always loved reading good historical writing that brings huge events down to a human scale. Jill Lepore is a master at that, whether she’s discussing a war in the seventeenth century or a comic book character in the twentieth. 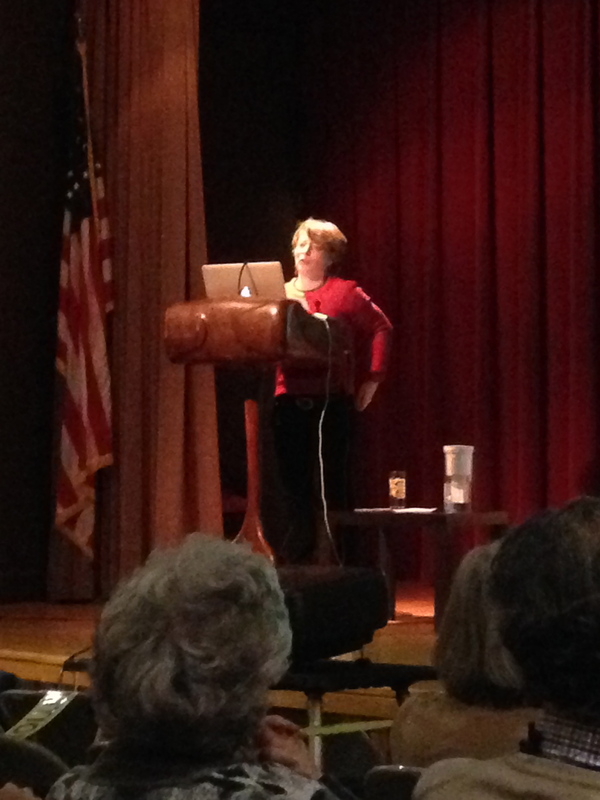 Previous Previous post: Postcard from Washington, D.C.
Maura Elizabeth Cunningham has posted an article about Jill Lepore’s recent appearance at the Free Library of Philadelphia to discuss her new book, The Secret History of Wonder Women. Lepore’s new book at first glance appears to be a departure from her previous work as an early American historian, but Cummingham explains how this new book is clearly connected to her earlier work. Lepore’s position as a staff writer for the New Yorker allows her to easily move beyond her academic field. Additionally, only academics would be skeptical of 18th and 19th century Americanist writing about 20th century America. Check out Cunningham’s post at Mauracunningham.org.